New Bedford High School’s updated new pool facility was opened Thursday morning at the high school by Mayor Jon Mitchell and school officials. The upgrades have made the new pool a state-of-the-art system with automated treatment mechanisms for its water as well as new cosmetic features including tiling. “We are making investments in every aspect of New Bedford High School from academics to technology to plant equipment. Upgrades and repairs to this pool facility were long overdue and this project exemplifies our commitment to our students and to getting things done,” said Mayor Mitchell. 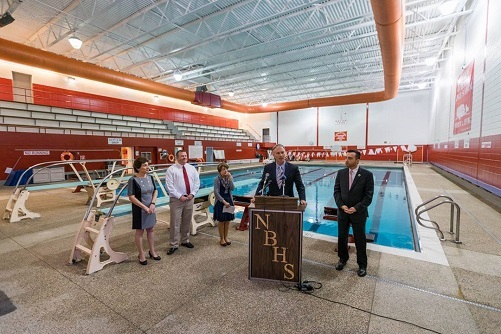 The upgraded pool facility represents continued investment at New Bedford High School, along with programs such as a new dual enrollment program for Grade 8 students from across the city who now take Grade 9 math and English classes. The Mobile Technology Learning Center of the University of San Diego has also begun to pilot a one-to-one technology initiative with tablets for NBHS freshmen, funded by alumnus and Qualcomm founder Dr. Irwin Jacobs.